For the last several years our family has been having our meals off Corelle dinner plates. Those spanking new-looking, untarnishable, unbreakable symbols of modernity in a middle-class household. The virgin-white affairs with tiny floral prints. Not that it was always like that, the precursor to this was Melamine, which over a period degenerated into a commodity. Something which got sold by the kilos off the footpaths of Dadar and Karolbagh. Or Commercial Street and Pondy Bazaar in the South. And prior to that was stainless steel! That pristine iron alloy! A household using stainless steel vessels had “arrived”. That was the predominant feeling when I was growing up in a small town, Jamshedpur, way back in early 70’s! Households used different kinds of utensils. And that, for keen observers, marked a sharp class difference. Enamelled dishes were meant for household pets. Period! Brassware was old-fashioned and were used only during pujas at home and other ceremonial occasions like marriage ceremonies, Satyanarayan Bhagwan Kathas etc. Though light in weight, low cost and heat-efficient, aluminum vessels were considered infra-dig. I remember the arrival of the first pressure cooker into our household. As is the norm, the cooker was made of aluminum, and for good reasons. While the possession of a pressure cooker was a matter of pride, perhaps the joy would have been far greater were it to be made of stainless steel. Chinaware was too modern and households which were lucky to have these would have them on perpetual display in a cabinet. God forbid if a plate were to break or chip! But even a damaged plate was put to use. Essentially reserved for domestic help. Or for those rare occasions when we, the siblings, would consume non-vegetarian food at home. The non-veg. stuff of course was never cooked at home but cooked and delivered by a generous neighbour! When I was a kid I would insist on having my meals off a specific plate. You will wonder what distinguished one plate from another. There was one unique feature, the engraved name on the plate. Whenever new vessels were bought, our mother, mai, would have names engraved on them. Typically, names of her children. This service was provided by the shopkeeper gratis. The name would be written on a piece of paper for the reference of the engraver who would pull out his machine and diligently set to work. Soon enough the “customized” dinner plate was ready. Different vessels had different engraving locations; the outer periphery on the reverse for the plate. In case of a katori, the name showed up on top of the outer surface close to the edges. So I had at least one thali and one katori with my name and I was quite possessive of these! Initially the thali was new and all-shining. And when the metal dulled and wore with the ravages of time (and strong doses of cleaning powder), the engraving would nearly vanish and it was a game to figure out from the faded lettering which plate “belonged” to whom! A shiny thali had one more rather creative use; it would serve as a mirror when new. With passage of time the surface would get dulled and the plate would lose its original shape and then the reflection in the plate was reminiscent of the “Hall of Horrors” which one would visit in the melas. The reflection would come out all distorted and I had hours of fun making funny faces and watching the contorted, and faded, images on the plates! Stainless Steel was an all purpose gifting idea, the quantity and quality of steel being determined by the “weight” of the occasion (annaprashan or someone’s daughter’s wedding). A katori and chammach would do for the former while a set of six dinner plates would be more suited for the latter. The gift also depended on the strength of the relationship enjoyed. If the kid enjoying the annaprashan was of a close relative’s, the katori and chammach could even be a silver affair or at least a set of Johnson’s Baby products along with the stainless steel katori et al. Similarly, for a close relative’s daughter’s wedding, a stainless steel dinner set was in order. There were a few pre-packaged brands available, the popular one being from SAIL (the “Salem steel” set). My marriage brought with it my wife, a welcome addition to my hitherto bachelor’s den. And with my wife and her many suitcases of her clothes, arrived a most welcome enhancement for my kitchen, a whole new shiny set of stainless steel utensils and vessels! Which brings me to a story which sounds amusing now. I had my first invite to a birthday party. I must have been in Std One or Two. Those days, birthday celebrations were limited to one’s family and a special meal cooked at home for all to relish. Maybe a book of two gifted by parents. No hoopla of birthday cakes, balloons or streamers. No kids invited either. And here I was all agog with excitement about this friend’s birthday party. But the problem was, while I knew one had to carry a gift, I had no idea what gift to give. Parents had the solution, a stainless steel katori, of course. I still remember the amazement on my friend’s face as he unwrapped the pink gift wrapper off the katori. I do not know what he did with it later, but for that evening, the katori was displayed among all the books and toys and teddys he had received! I was a bit embarrassed, but this embarrassment was soon forgotten among the fun and games. I was a wiser man afterwards, no more stainless steel katoris for a classmate’s birthday party! Now, thinking back, stainless steel had a kind of permanence. A symbol of middle class solidity. Imperishable, indestructible, inviolate. A “stainless-ness” a middle class family covets. That I think we lack in the ceramic versions (whether melamine or Corelle). Stainless Steel had a sonorous “ring” to it- a certain tone of voice if you please- which heralded to the world that the user family had arrived! The ceramic versions announce fragility (Corelle claims apart), the ephemeral nature of relationships nowadays. Give me stainless steel, anyday! PS: As luck would have it, At my engineering college at BHU, Varanasi, I studied Metallurgy- the engineering science dealing with metals and alloys. Including stainless steel. For the life of me I do not remember the composition of the steel alloy beyond a cryptic set of digits, 18:8. Do not even remind me of the dreaded iron-carbon diagram. That, dear readers, is another story! “Santosh Ojha’s Weblog” turns one today. It is your encouragement which has kept me going for the last 12 months. Thank you very much, dear readers! You may have realized that this is not a “blog” blog in the sense that I rarely write about my day-to-day experiences. Neither do I comment on current affairs. As I look back over the last twelve months, here are things I have not touched upon: Obama/McCain, Mumbai terrorist attacks, the global meltdown, India’s general elections etc. No Rahul Gandhi. No Rakhi Sawant. No Indian Idol. Not even pink chaddis! I see myself as an entertainer. I find writing a great source of entertainment for me. If you have found some posts of mine entertaining, I am very happy. Of the nearly one hundred posts on my blog, most are on nostalgia and travel. Going by the responses I think readers of my age group like the nostalgia pieces. Even those about mundane stuff I experienced during my growing-up days in Jamshedpur in 60’s and 70’s. My father, who I send print-outs of most of my pieces, wonders why I write about my very middle-class upbringing. To him I say, because I am proud of it. And that I want my children who have a relatively more privileged life to know about it. A good friend of mine keeps telling me that I wear my small-town, middle-class upbringing as a badge-of- honor! You would have also noticed a large number of travel pieces on blog. I love travelling. Thankfully my work, too, takes me to some interesting places. I was in Jamshedpur for Durga Puja after many years. I had written a nostalgia piece on the Jamshedpur Pujas prior to going there. Many liked it and I attempted a Puja reportage – daily reports from Jamshedpur on what I saw those four days. Much to my surprise, this proved to be a bit of a hit. The Jamshedpur diaspora across India and some outside as well were following the Puja pieces. Such are the emotions generated by Jamshedpur Pujas. Those who have been reading my blog for some time would notice that I have not changed the look of the webpage. And, despite my plans otherwise, the name remains a simple “Santosh Ojha’s Weblog”. When I asked for suggestions, someone said that this name was too boring, and that this should be something as freaky and startling as “Pyaasi Atma”. I know the layout is boring, the name even more so. I hope the contents are slightly better than these! For your support, encouragement and indulgences, thanks once again, dear readers! 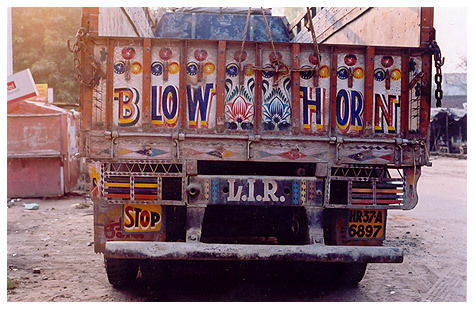 A close friend of mine tells me that the truckers of North India have a strong kinship with the “yamdoots“, ever ready to swoop on you and whisk you away to meet your maker. Maybe my friend has had some issues with these souls on his highway drives. Maybe he is being a bit cynical. But for me, the trucker is very humane, a considerate fellow-user of the highway, a philosopher, a responsible citizen of India, a die-hard romantic, and only at times contemptuous of those who cast an evil eye on either his vehicle or his vocation. And above all, a great philosopher poet. I have always nursed a secret admiration for these gentlemen who roam the length and the breadth of the country ferrying goods from one end of the country to another. I have always admired these magically-bedecked trucks. The silk tassles, the red cloth from Vaishno Devi slung on the rear-view mirror fluttering in the breeze as the truck speeds past, the dangling shoe and the string of lemons slung at the back of the vehicle, and of course the marvellous graffiti (what else can I call it) painted all over the vehicle. Especially at the back of the truck. I used to be a “collector” of this graffiti, slogans, poetry- call it whatever you may- for several years. One big regret is the loss of the diary where I would diligently note these down. However, I do remember some, and these find their way into this post. Please do add to the ones mentioned in this piece below. To start with the truckers are unfailingly polite. And always have a friendly suggestion or advice for their co-travellers on the highway. I used to wonder what this phrase, unique only to trucks, means. Initially I thought they wanted the horn toot to be just OK, not too soft, nor too harsh. It was only later I figured out that the actual phrase was “Horn Please”. The large OK painted at the center was only a design element. What starts off with blessing to the children of the one with the evil eye ends with a sting in the tail: May your children be condemned to a lifetime of addiction to country liquor. Dont miss the play on the word,”शेर”! A trucker’s life is largely spent away from home and he finds solace in his vehicle. And he starts treating the truck as his beloved. The truck is always a “she”, a young playful lover for our truckman. One of the closest friends during my growing-up days was Murphy. A loyal friend, always reliable. Well, almost always! It was ready to sit up with me through the nights as I struggled with my exam preparations. And Murphy was one loyal entertainer! Never a dull moment with Murphy around. Now a long forgotten name, Murphy used to be a leading brand of radios in those days. Remember? We had the most gorgeous set ever, valves and all. Squarish one, with circular knobs for volume and frequency setting. A knob for navigating from medium wave to short wave 1, 2 and 3. The radio panel had a neatly printed list of broadcasting stations: Dacca, Hyderabad, Delhi, Lahore, Karachi etc. It amazed me as to why some cities long separated from India still found a mention on the panel. Maybe the radio was produced so long ago, maybe not. I wonder why I never questioned this of my parents. It took some two minutes for the valves to warm up before we could hear any sound, and a few more minutes to zero onto the radio station of our choice. And then the somewhat unpredictable nature of the antenna which had to be coaxed into action during inclement weather by dexterous realignment. Some brave souls, like me, would clamber up to the house terrace to fix the antenna. Jamshedpur had no local dailies then and no television, of course. So we would tune into our radio for any breaking news. Indo-Pak war of 1971, unseating of Indira Gandhi in the Allahabad High Court judgment, the notorious emergency of 1975, the general elections of 1977 and so on. All India Radio (AIR) was government controlled, full of government propaganda. Hence we would turn to the Hindi service of the BBC at 8 pm for authentic news. Our journalist heroes those days were Mark Tully, then the India correspondent for the BBC and the broadcaster Ratnakar Bharatiya who had an amazing voice. And of course the commentaries of cricket and hockey matches. Does anyone remember Jasdev Singh’s electrifying description of a sudden center forward move; precise, speedy, accurate. And ending with the excited shout, “aur yeh goal! !” And Dicky Rutnagur with his clipped accent commentating on cricket. I followed India’s famous cricket World Cup victory in 1983 on the radio. When I told this to my sons, they were aghast! How could anyone follow a live cricket match via an audio commentary! While news and commentaries were important, film songs were a key attraction. Good- old Murphy was the only source of entertainment we had. No TVs those days in Jamshedpur, record player with its 33 1/3 speed discs out of reach for most of us, cassette players very new. (The days of WaIkman, iPod and MP3 players were far away!!). Over time, I gained expertise in coaxing Hindi film music out of our radio at virtually all times of the day. And night! The biggest attraction of course was Binaca Geet Mala. We would wait the whole week to listen to this Hindi film song countdown at 8 pm on Wednesdays, paper and pen in hand to make a note of each of the sixteen top songs of the week. The ‘sartaj” geet, given a farewell from the weekly countdowns with blows of a trumpet, was marked with an asterisk in out list. Sharp at 8pm, Ameen Sayani mellifluous voice would breeze in through the airwaves, “Bhaiyo aur behno…”, and the weekly magic would commence. In between the songs, Ameen Sayani would alternately promote Binaca toothpaste- and toothbrush, advice a young lover how to handle unrequited love, give a teaser of songs which could be a part of the Geetmala or deliver homilies on how to be a better person. All delivered in his friendly and soothing voice. 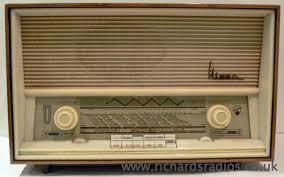 How easy it is now for kids to just press a few buttons on the radio and get their favourite FM channels going. And flip to the next one with total ease! Will they ever understand the joys of coaxing a radio to action! Will they ever understand the joys of a radio? When I was growing up, the refrigerator was a rarity in most middle-class households. It was something to be inspected with great admiration and awe when visiting a rich uncle’s place! Kids would hover around the ‘fridge waiting for the hostess open the door and enjoy the sudden gust of cold air. A delight to the senses! 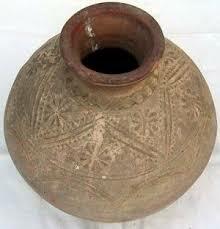 The source of cold water in those hot and humid days in the summers of Jamshedpur was a “surahi”. We rationalized this by telling ourselves that the surahi water was much more “natural” compared with the ‘fridge water. Could the ‘fridge ever replicate the delectable earthy flavour of the surahi water? Never! Just at the onset of summer, a new surahi would be purchased and installed in a corner of the kitchen. The narrow opening of the surahi would be covered by a little clay lid to keep the dust and flies away. You come home, take a steel tumbler, tip the surahi at an angle on its base, fill the tumbler and enjoy the elixir! In a few days the lid would slip from someone’s hands and would promptly be replaced by a steel katori or a small steel saucer. Those days guests would arrive unannounced. A knock on the door and there were the guests! Real ‘atithis‘. These were the days when the mobile phone was not there and even the now humble BSNL (then called “P&T department”) a phone connection was hard to get. Well, nearly impossible, unless you knew someone in the P&T department. Mai, my mother, would quickly prepare for the visitor a glass of “saunf-ka-sherbat“. She would get on to the sil-lodha set and grind some saunf. This would be stirred into a stainless steel glass filled with two spoons of sugar and water from the surahi. I forgot, the saunf concoction would get filtered by the nearest available clean piece of cotton cloth (an old, washed cotton sari piece or a clean handkerchief) and off it would be sent, to the guest. I still remember the taste of this divine drink. Clear, tangy and with just a hint of an after-bite. Over time saunf was replaced by Kisan Orange Squash, perhaps due increasing peer pressure! Family affluence had no part to play, that I can vouch for, as this professor’s family hardly saw any influence. Surahi’s cousin was a ghada, a larger pot. But it worked on the same principle of cooling. With a view to stabilize the ghada on the floor, and to maintain its cooling efficiency, it was placed on a little bed of sand. Surhais would come in different configurations. While the basic style was the most popular, there were those which had designs on the surface while some even had a tap at the base of the surahi. And this great device was also portable. Like when you undertook a long train journey, you would carry a surahi along with you. And if you had forgotten to carry it, there were vendors at the rail station where you could buy one! My sons would probably now see a surahi now only at a museum, maybe when inspecting the remains of Mohen-jo-daro civilization! I was hoping to conclude this story with this second piece. But like part 1, part 2 too has been longer than planned. And there have been a lot of suggestions from some of you suggesting other devices. So, perhaps, I will write about more than five of these devices. But I promise to conclude this in the next post of this series. You are currently browsing the Santosh Ojha's Weblog blog archives for May, 2009.